Paul Legentilhomme was born on March 26, 1884 in the city of Valognes. He first entered the military as a cadet at the l'Ecole spéciale militaire de Saint-Cyr, loosely translated as The Special Military School of Saint-Cyr, in 1905. After graduation, he entered the Colonial Infantry. He was assigned to the Régiment de Tirailleurs Tonkinois and was promoted to Lieutenant. He stayed with Tonkinois until July 1912, when he was transfered to a different unit before the start of World War I. In 1914, he was captured by German troops and held captive until 1918. Upon his arrival to France, he was promoted to the rank of Captain. 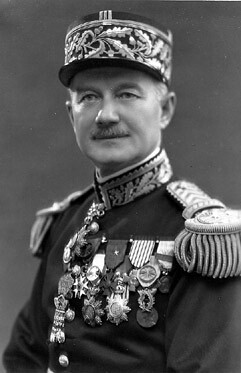 During the Interwar period, Legentilhomme was promoted to Major, Lieutenant Colonel, Colonel, and finally Brigadier-General. In 1939, Legentilhomme became the senior commander of French troops in Somaliland(present day Djibouti). In January, with 4000 men and a hand full of war machines, Legentilhomme begins fortifying Djibouti from an attack from Ethiopia by Italian forces. In early June of 1940, 8000 men defended Djibouti from an Italian attack. France agrees to an armistice with Italy, but Legentilhomme denounced it and was replaced. He was relocated to England on October 31, and stripped of his French nationality by the Vincy Government. In 1941, he returned to Africa and became the General of the Free French forces in Sudan and Eritrea. On September 24, 1941, Legentilhomme was appointed as the French National Commissioner War, and was sentenced to death for treason due to his absents the next day. Near the end of World War II, Legentilhomme was appointed as the Military Governor of Paris, at which time he was present at the signing of the document of which this website is based on. In 1947, Legentilhomme retired. General Paul Louis Legentilhomme died May 23, 1975, in Villefranche-sur-Mer. 1. "Biography of General Paul-Louis-Victor-Marie Legentilhomme." Generals of World War II. 2000. Web. 28 May 2010. <http://www.generals.dk/general/Legentilhomme/Paul-Louis-Victor-Marie/France.html>. 2. "Ordre De La Libération." ORDRE DE LA LIBÉRATION, Musee De L'ordre De La Libération. Web. 28 May 2010. <http://www.ordredelaliberation.fr/fr_compagnon/576.html>. 3. "The World at War - FRENCH SOMALI COAST 1708 - 1946." Web. 28 May 2010. <http://www.schudak.de/timelines/frenchsomalicoast1708-1946.html>.